Submitted by Dan Dooré on Thursday, May 24, 2018 - 13:13. Wubtris is a simple Tetris clone for the Sam Coupe for 1 or 2 players. 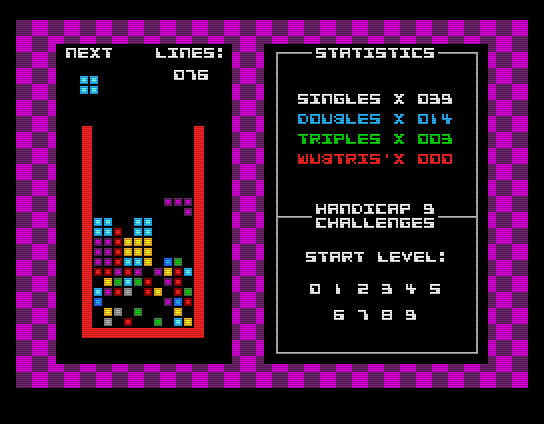 To complete the 1 player mode score 100 lines or more on all 10 speed settings with the handicap level maxed out. These challenges can also be completed in the 2 player mode by either player so “1 player mode” is something of a misnomer! For 2 players, this version of wubtris features the slightly pointless head to head game and the slightly better battle mode. In the head to head game the loser in each round is the player who, er, loses first! The number of lines scored means nothing and so this game mode is a bit crap really. In the battle mode scoring multiple lines pushes up your opponents play area by that amount of lines-1. The lines do not get added to the game area until the victims current piece is dropped and any further lines that are scored against the player in the meantime are added to the total. Both game modes can be played as a best of or first to 3, 5 or 7 games. Player 1 can use the joystick or keys 6,7,8,9 and 0. Player 2 uses keys Q,A,Z,X and space. 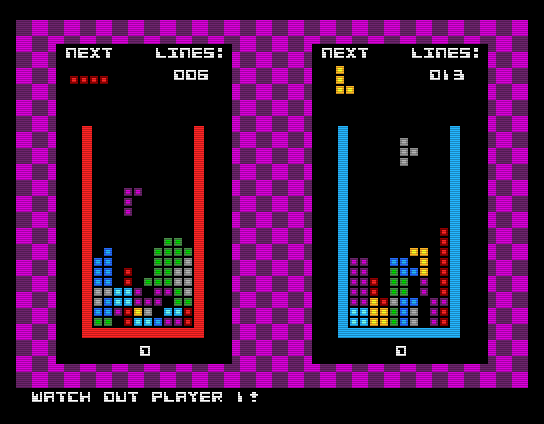 The controls cannot be re-defined in this version of wubtris.